Father of American spaceflight; launched first liquid-fuel rocket, 1926. By 1936, he had solved all of the fundamental problems of guided liquid propellant rockets and was testing essentially modern vehicles. But he was reclusive, took patents but did not share lessons learned with others. Aerojet and von Braun did not benefit from his experience. 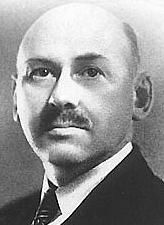 Robert H. Goddard was one of the three most prominent pioneers of rocketry and spaceflight theory. He earned his Ph.D. in physics at Clark University in 1911 and went on to become head of the Clark physics department and director of its physical laboratories. He began to work seriously on rocket development in 1909 and is credited with launching the world's first liquid-propellant rocket in 1926. He continued his rocket development work with the assistance of a few technical assistants throughout the remainder of his life. Although he developed and patented many of the technologies later used on large rockets and missiles--including film cooling, gyroscopically-controlled vanes, and a variable-thrust rocket motor--only the last of these contributed directly to the furtherance of rocketry in the United States. Goddard kept most of the technical details of his inventions a secret and thus missed the chance to have the kind of influence his real abilities promised. At the same time, he was not good at integrating his inventions into a workable system, so his own rockets failed to reach the high altitudes he sought. Parallel work by von Braun in Germany and at the Jet Propulsion Laboratory in Pasadena duplicated his discoveries and led to post-war rocketry in Russia, Europe, and America. Primitive in their day as the achievement of the Wrights, Goddard's rockets made little impression upon government officials. Only through the modest subsidies of the Smithsonian Institution and the Daniel Guggenheim Foundation, as well as the leaves of absence granted him by Worcester Polytechnic Institute of Clark University, was Goddard able to sustain his lifetime of devoted research and testing. He worked for the U.S. Navy in both World Wars. Eighteen years after his successful demonstration at Auburn, Goddard's pioneering achievements came to life in the German V-2 ballistic missile. Goddard first obtained public notice in 1907 in a cloud of smoke from a powder rocket fired in the basement of the physics building in Worcester Polytechnic Institute. School officials took an immediate interest in the work of student Goddard. They, to their credit, did not expel him. He thus began his lifetime of dedicated work. In 1914, Goddard received two U.S. patents. One was for a rocket using liquid fuel. The other was for a two or three stage rocket using solid fuel. At his own expense, he began to make systematic studies about propulsion provided by various types of gunpowder. His classic document was a study that he wrote in 1916 requesting funds of the Smithsonian Institution so that he could continue his research. This was later published along with his subsequent research and Navy work in a Smithsonian Miscellaneous Publication No. 2540 (January 1920). It was entitled "A Method of Reaching Extreme Altitudes." In this treatise, he detailed his search for methods of raising weather recording instruments higher than sounding balloons. In this search, as he related, he developed the mathematical theories of rocket propulsion. Towards the end of his 1920 report, Goddard outlined the possibility of a rocket reaching the moon and exploding a load of flash powder there to mark its arrival. The bulk of his scientific report to the Smithsonian was a dry explanation of how he used the $5000 grant in his research. Yet, the press picked up Goddard' s scientific proposal about a rocket flight to the moon and erected a journalistic controversy concerning the feasibility of such a thing. Much ridicule came Goddard's way. And he reached firm convictions about the virtues of the press corps which he held for the rest of his life. Yet, several score of the 1750 copies of the 1920 Smithsonian report reached Europe. The German Rocket Society was formed in 1927, and the German Army began its rocket program in 1931. Goddard's greatest engineering contributions were made during his work in the 1920's and 1930's (see list of historic firsts). He received a total of $10,000 from the Smithsonian by 1927, and through the personal efforts of Charles A. Lindbergh, he subsequently received financial support from the Daniel and Florence Guggenheim Foundation. Progress on all of his work was published in "Liquid Propellant Rocket Development," which was published by the Smithsonian in 1936. Goddard's work largely anticipated in technical detail the later German V-2 missiles, including gyroscopic control, steering by means of vanes in the jet stream of the rocket motor, gimbalsteering, power-driven fuel pumps and other devices. His rocket flight in 1929 carried the first scientific payload, a barometer, and a camera. Goddard developed and demonstrated the basic idea of the "bazooka" two days before the Armistice in 1918 at the Aberdeen Proving Ground. His launching platform was a music rack. Dr. Clarence N. Hickman, a young Ph.D. from Clark University, worked with Goddard in 1918 provided continuity to the research that produced the World War II bazooka. In World War II, Goddard again offered his services and was assigned by the U.S. Navy to the development of practical jet assisted takeoff NATO) and liquid propellant rocket motors capable of variable thrust. In both areas, he was successful. He died on August 10,1945, four days after the first atomic bomb was dropped on Japan. Goddard was the first scientist who not only realized the potentialities of missiles and space flight but also contributed directly in bringing them to practical realization. This rare talent in both creative science and practical engineering places Goddard well above the opposite numbers among the European rocket pioneers. The dedicated labors of this modest man went largely unrecognized in the United States until the dawn of what is now called the "space age." High honors and wide acclaim, belated but richly deserved, now come to the name of Robert H. Goddard. On September 16, 1959, the 86th Congress authorized the issuance of a gold meal in the honor of Professor Robert H. Goddard. In memory of the brilliant scientist, a major space science laboratory, NASA's Goddard Space Flight Center, Greenbelt, Maryland, was established on May 1, 1959. Goddard 1 American test vehicle. Rocket used by Goddard to achieve the first flight of a liquid-propellant rocket. Goddard 2 American test vehicle. After several tests indicating the model was too small to permit refinements, Goddard decided to build a rocket twenty-fold larger. During 1926 a new tower was built, and flow regulators, multiple liquid injection into large combustion chambers, means for measurement of pressure and lifting force, electrically fired igniter, and turntable for rotation were developed. Goddard 3 American test vehicle. First instrumented liquid fuel rocket. Length 11 ft 6 in. ; maximum diameter 26 in. ; weight 32 lb; gasoline 14 lb; liquid oxygen 11 lb; total loaded weight 57 lb. Goddard 4 American test vehicle. Goddard rocket using pressure-fed LOx/Gasoline propellants, streamline casing, and remote control guidance. Masses varied; typical values indicated. Goddard A American test vehicle. The A series rockets used simple pressure feed, gyroscopic control by means of vanes, and parachute. The rockets in this series averaged in length from 4.11 m to 4.65 m.; their weight empty varied from 26 kg to 39 kg. Goddard K American test vehicle. This consisted of ten proving-stand tests for the development of a more powerful motor, 10 in. in diameter. Weight of rocket, about 225 lb; weight of fuels, 50-70 lb for the series. Goddard L-A American test vehicle. Tests of the Goddard L Section A covered development of a nitrogen-pressured flight rocket using 10 in, motors based on the K series and ran from May 11 to November 7, 1936 (L1-L7). Length of the L Series Section A rockets varied from 10 ft 11 in, to 13 ft 6 1/2 in. ; diameter 18 in. ; empty weight 120 to 202 lb; loaded weight 295 to 360 lb; weight oxygen about 78 lb; weight gasoline 84 lb; weight nitrogen, 4 lb. Goddard L-B American test vehicle. The L-B series were check tests of 5.75-in.-diameter chambers with fuels of various volatilities; development of tilting cap parachute release; tests of various forms of exposed movable air vanes; test of retractable air vanes and parachute with heavy shroud lines. The series ran from November 24, 1930-May 19, 1937 (L8-L15). Final results of Section B of L Series showed two proving-stand tests, and six flight test attempts, all of which resulted in flights. Average interval between tests 22 days. Goddard L-C American test vehicle. Series L Section C rockets included light tank construction, movable-tailpiece (i.e. gimbal) steering, catapult launching, and further development of liquid nitrogen tank pressure method. Lengths varied from 17 ft 4.25 in. to 18 ft 5.75 in. ; diameter 9 in., weight empty varied from 80 to 109 lb; loaded weight about 170 lb or more; lift of static tests varied from 228 lb to 477 lb; jet velocities from 3960 to 5340 ft/sec. Goddard P-C American test vehicle. Section C tests would run through October 10, 1941 and represent the final Goddard rocket flight tests. The series of twenty-four static and flight tests (P13-P36) was made with rockets of large fuel capacity, with the rocket motor, pumps, and turbines previously developed. These rockets averaged nearly 22 ft in length, and were 18 in, in diameter. They weighed empty from 190 to 240 lb. The liquid-oxygen load averaged about 140 lb, the gasoline 112 lb, making "quarter-ton" loaded rockets. Family: Early Rocketry. People: Goddard. Country: USA. Bibliography: 12, 17, 482, 5439. The world's first liquid fuel rocket. 1882 October 5 - . Robert Goddard is born. - . Nation: USA. Related Persons: Goddard. 1899 October 19 - . Goddard's dream. - . Nation: USA. Related Persons: Goddard. Goddard's imagination and inventiveness is encouraged by his father, who gives him a telescope, microscope, and subscription to Scientific American. He is constantly tinkering, trying to work aluminium, build a rigid-skin balloon. Illness prevents him from attending classes, so he becomes self-educated. Uniquely among rocket pioneers he is inspired by H G Wells' War of the Worlds rather than the works of Jules Verne. On this date, while climbing a cherry tree, the ten year old had a vision. He saw a huge flying machine, propelled by whirling unequal horizontal centrifugal devices, rising from a pit, heading for Mars. Although he would give up working on a 'perpetual motion' device of this type for several years, he abandoned the idea when he discovered Newton's laws of motion. 1902 January 27 - . Goddard multistage guns - . Nation: USA. Related Persons: Goddard. In an article rejected by Popular Science News, Goddard proposes staged nested cannons to achieve high velocities..
"..the dream of yesterday is the hope of today and the reality of tomorrow..." - . Nation: USA. Related Persons: Goddard. Goddard delivers this line in his high school graduation speech, 'On Things Taken for Granted'..
Goddard levitated train concept - . Nation: USA. Related Persons: Goddard. Goddard enters Worcester Polytechnic, where he will earn his bachelor degree. While there, he writes an essay, 'Travelling in 1950', which envisions use of magnetically-levitated high-speed trains travelling in evacuated vacuum tubes. The concept will be patented by his estate in 1950. His notebooks are filled with space travel - use of aerobraking for planetary capture, methods of protection from meteoroids, use of suspended animation for interstellar flight. 1909 February 2 - . Goddard Lox/LH2 rocket concept - . Nation: USA. Related Persons: Goddard. Goddard realises his earlier nested gun concept is not practical - he calculates it will take 56 tons of explosive to launch a 500 pound payload to an altitude of 2,000 miles. He realises Lox/LH2 will make the ideal rocket fuel, although he is still thinking in terms of explosive pulses. 1911 June 19 - . Goddard receives PhD from Clark University - . Nation: USA. Related Persons: Goddard. Goddard's doctoral thesis is on a radio principle very similar to the transistor. But his secret passion remains rocketry and space travel. After a one year fellowship at Princeton, Goddard will return to Clark to teach as an assistant professor of physics. 1913 March 22 - . Goddard diagnosed with tuberculosis. - . Nation: USA. Related Persons: Goddard. The doctors thought he had just two weeks to live. During the months of recuperation that followed, Goddard conceived the basic concepts of rocketry, leading to patents the following year..
1914 July 7 - . Goddard patents multi-stage rocket. - . Nation: USA. Related Persons: Goddard. Goddard receives US Patent 1,102,653, covering the concept of using multiple rocket stages to achieve high velocities..
1914 July 14 - . Goddard patents liquid fuel rocket - . Nation: USA. Related Persons: Goddard. Goddard receives US Patent 1,103,503. Although mainly concerned with his concept of cartridge rockets, a brief section fully outlines the concept of liquid rocket propulsion..
First Goddard rocket tests. - . Nation: USA. Related Persons: Goddard. While teaching at Clark University, Goddard made many tests with existing rockets in 1915-1916 to determine their efficiencies, which were found to be very low (2%). Redesigned rockets were then tested, using black and smokeless powders. Goddard managed to achieve a 16.7% efficiency with a DeLaval nozzle. By mid-summer 1915, improved nozzles were achieving efficiencies of 40% and jet velocities of 6730 ft/sec. First Goddard rocket flight tests - . Nation: USA. Related Persons: Goddard. Goddard's modified black powder rockets, launched from Coes Pond, Massachusetts, reached 480 feet and demonstrated jet velocities of up to 8000 ft/sec. .
1916 September 27 - . Goddard runs out of money - . Nation: USA. Related Persons: Goddard. Goddard, on an assistant professor's salary of US$ 1,000 per year, had used up his savings in rocket research. He wrote to the Smithsonian Institution, asking for research grant. When asked for supporting documentation, he submitted the draft of 'A Method of Reaching Extreme Altitudes', which proposed using multi-stage smokeless powder cartridge rockets to achieve altitudes of hundreds of miles. The cartridge rocket consisted essentially of a gun-like thrust chamber, into which a series of smokeless power cartridges would be automatically loaded and fired to produce thrust..
1917 January 5 - . Goddard receives grant for rocket research - . Nation: USA. Related Persons: Goddard. Goddard receives US$ 5,000 Hodgkins Fund grant from Smithsonian, allowing him to continue development of the cartridge rocket..
1917 May 19 - . Goddard proposes sonar to US Navy - . Nation: USA. Related Persons: Goddard. The Navy advises they are not interested in the device..
1917 June 19 - . Goddard develops bazooka - . Nation: USA. Related Persons: Goddard. Goddard receives $ 20,000 from US Army Signal Corps for rocket development. Together with his assistant Clarence N Hickman he develops a prototype of the World War II bazooka at the Mount Wilson Observatory in California..
1918 November 6 - . Goddard demonstrates rockets to US government. - . Nation: USA. Related Persons: Goddard. After demonstrations to Army officers of work achieved at Mt Wilson, Goddard is requested to demonstrate his rockets at the Aberdeen Proving Ground in Maryland. The scientists and representatives of the Signal Corps, Air Service, Army Ordnance, are most impressed ('this will revolutionise warfare'). Goddard admits that his cartridge rocket concepts have been less successful and 'need further work'. The next day, Germany surrenders, World War I ends, and funding dries up. 1919 January 19 - . Goddard resumes teaching at Clark University - . Nation: USA. Related Persons: Goddard. From 1919 to 1930 he resumed full-time teaching at Clark University, and could devote only spare time and summers to rocket research..
1920 January 11 - . Smithsonian publishes Goddard's "A Method of Reaching Extreme Altitudes" - . Nation: USA. Related Persons: Goddard. Goddard's work lays out the concept of using the multi-stage rocket for exploration of outer space and reaching the lunar surface. It spawns a nightmare of media interest and derision, making Goddard even more secretive of his dreams for space flight..
1920 March 19 - . Goddard's dreams of space flight - . Nation: USA. Related Persons: Goddard. Goddard receives a grant of $ 3,500 from Clark University to continue rocket research. In a letter to the fund supervisor, he lays out his advanced concepts - Lox/LH2 liquid rockets, use of solar thermal and ion engines for interplanetary travel, constant-thrust 7.13 week trajectories to Mars. But publicly and practically, he continues his work on cartridge rockets. 1920 July 19 - . Goddard contract from the US Navy - . Nation: USA. Related Persons: Goddard. Goddard accepts contract from US Navy for US$ 100 per month. On weekends, holidays, and vacations, when not working at Clark University, Goddard travels to Dahlgren, Virginia to test his military solid fuel rockets..
1920 August 19 - . Final test of Goddard cartridge rocket at Aunt Effie's Farm, Massachusetts. - . Nation: USA. Related Persons: Goddard. Apogee: 0.0180 km (0.0112 mi). Final test of cartridge rocket (a series of smokeless power cartridges, automatically loaded into a gun barrel and fired in sequence to produce thrust). Four of the five cartridges fire, but the fifth jams. The rocket only achieves 60 feet, the highest altitude to date. 1921 January 28 - . Goddard begins liquid propellant rocket research - . Nation: USA. Related Persons: Goddard. Goddard realises after three years of unsuccessful tests that the cartridge rocket concept is too complex and that a new approach is needed. Smokeless powder solid fuels were too unstable for rocket use. Therefore Goddard turned to liquid oxygen and gasoline as propellants. On this date he bought his first can of liquid oxygen from Linde Corporation in Worcester. He had to haggle for it; the liquid form was then only a by-product in the process of extracting gaseous oxygen from the atmosphere. Goddard was charged $ 10 per 2 gallon flask, the minimum Linde would sell to him. 1921 June 1 - . Goddard begins liquid rocket experiments. - . Nation: USA. Related Persons: Goddard. 1922 March 25 - . Goddard first thrust from liquid rocket engine - . Nation: USA. Related Persons: Goddard. Goddard's test engine produced 4 pounds thrust for a brief period..
Goddard develops liquid propellant engine - . Nation: USA. Related Persons: Goddard. Goddard developed a small liquid-oxygen pump and engine, which operated, but was on too small a scale to be satisfactory..
1923 March 19 - . US Navy discontinues contract with Goddard - . Nation: USA. Related Persons: Goddard. During the previous three years, at a total cost of $ 2,000, Goddard had developed a rocket-propelled depth charge and anti-ship missile with an armour-piercing warhead. The Navy sees no future potential in the work..
1923 November 1 - . Goddard tests first liquid rocket motor. - . Nation: USA. Related Persons: Goddard. Robert H. Goddard successfully operated a liquid oxygen and gasoline rocket motor on a testing frame, both fuel components being supplied by pumps installed on the rocket..
Further Goddard work on liquid propellant engines - . Nation: USA. Related Persons: Goddard. Goddard worked on a displacement cylinder model; two pumps and two engines; a powder igniter; and refractory-lined combustion chambers and nozzles..
1925 December 6 - . LV Family: Goddard. Launch Vehicle: Goddard 1. First net thrust by a Goddard liquid fuel rocket. - . Nation: USA. Related Persons: Goddard. Returning to the simple pressure feeding of the liquid propellants, to reduce weight, Goddard obtained in the Clark University Physical Laboratories a 24-sec test in which the lift was great enough to raise the rocket the last half of the run..
1925 December 30 - . LV Family: Goddard. Launch Vehicle: Goddard 1. Goddard test of liquid rocket. - . Nation: USA. Related Persons: Goddard. Rocket trembled in its support for 8 sec. .
1926 January 3 - . LV Family: Goddard. Launch Vehicle: Goddard 1. Goddard test of liquid rocket. - . Nation: USA. Related Persons: Goddard. Rocket again quivered for 17 sec..
1926 January 20 - . LV Family: Goddard. Launch Vehicle: Goddard 1. Goddard test of liquid rocket. - . Nation: USA. Related Persons: Goddard. The lift raised the rocket motor the full distance it could travel. Outdoor tests with a flight model were begun on March 8, 1926..
1926 March 16 - . Launch Site: Auburn. LV Family: Goddard. Launch Vehicle: Goddard 1. First flight of a Goddard liquid-propellant rocket. - . Nation: USA. Related Persons: Goddard. Apogee: 0.0125 km (0.0078 mi). Range: 0.0560 km (0.0348 mi). Goddard achieves the first flight of a liquid-propellant rocket at Aunt Effie's Farm, Auburn, Massachusetts. Altitude 41 ft; average speed 60 mph; in air 2.5 sec; landed 184 ft from launching frame; total path 220 ft. This event was the "Kitty Hawk" of rocketry. 1926 April 3 - . Launch Site: Auburn. LV Family: Goddard. Launch Vehicle: Goddard 1. Second flight of a Goddard liquid-propellant rocket - . Nation: USA. Related Persons: Goddard. Apogee: 0.0150 km (0.0093 mi). Goddard achieves the second flight of a liquid-propellant rocket. In air 4.2 sec; landed 50 ft from testing stand..
1926 May 5 - . LV Family: Goddard. Launch Vehicle: Goddard 1. Smithsonian informed of rocket test. - . Nation: USA. Related Persons: Goddard. Robert H. Goddard communicated the results of his successful liquid-propellant rocket flight of March 16 to the Smithsonian Institution..
1926 May 5 - . LV Family: Goddard. Launch Vehicle: Goddard 2. Goddard turns to larger liquid propellant rockets. - . Nation: USA. Related Persons: Goddard. After several tests indicating the model was too small to permit refinements, Goddard decided to build a rocket twenty-fold larger. During 1926 a new tower was built, and flow regulators, multiple liquid injection into large combustion chambers, means for measurement of pressure and lifting force, electrically fired igniter, and turntable for rotation were developed. 1927 January 18 - . LV Family: Goddard. Launch Vehicle: Goddard 2. Attempt to launch Goddard large model rocket - . Nation: USA. Related Persons: Goddard. Goddard's large model rocket set up in tower for the first time. Rocket and turntable lifted several times in following months, but no flights were obtained with the large model..
1927 September 3 - . LV Family: Goddard. Launch Vehicle: Goddard 3. Goddard third rocket design - . Nation: USA. Related Persons: Goddard. Goddard began construction on a rocket one-fifth size of the 'large model' (i.e. four times larger than 1926 flight models), with few, simple parts, easily replaced, and much-improved fuel injection..
1928 July 18, September 29, October 10, October 20 - . LV Family: Goddard. Launch Vehicle: Goddard 3. FAILURE: Tipped and caught in tower. Launch attempts of Goddard third rocket design - . Nation: USA. Related Persons: Goddard. 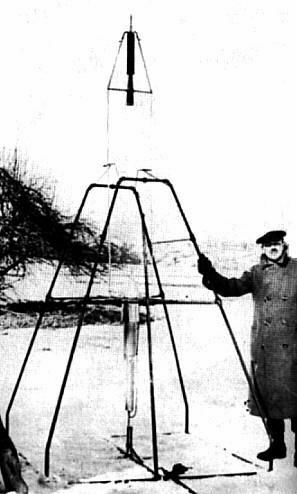 Goddard's third rocket design started to rise, but tipped and caught in tower every time..
1928 December 26 - . Launch Site: Auburn. LV Family: Goddard. Launch Vehicle: Goddard 3. Third flight of a Goddard liquid rocket. - . Nation: USA. Related Persons: Goddard. Apogee: 0.0050 km (0.0031 mi). Range: 0.0620 km (0.0385 mi). Rose out of tower rapidly and tipped, passing over observation shelter; distance 204.5 ft; speed about 60 mph. This flight was followed by a series of static tests, to develop liquid 'curtain cooling' for inside of combustion-chamber wall, a regenerative system, and better stability in flight. 1929 July 17 - . Launch Site: Auburn. LV Family: Goddard. Launch Vehicle: Goddard 3. Fourth flight of a Goddard liquid rocket; first with instruments. - . Nation: USA. Related Persons: Goddard. Apogee: 0.0270 km (0.0168 mi). Range: 0.0520 km (0.0323 mi). Started to lift at 13 sec; rose at 14 1/2 sec; reached top of flight (90 ft) at 17 sec; hit ground at 18 1/2 sec; landed 171 ft from tower. The rocket carried a small camera, thermometer, and a barometer which were recovered intact after the flight. Flight was bright and noisy, attracted public attention. The result was a great deal of "moon rocket" publicity. This resulted in prohibition of further test flights from Aunt Effie's Farm by the local fire marshall. Length 11 ft 6 in. ; maximum diameter 26 in. ; weight 32 lb; gasoline 14 lb; liquid oxygen 11 lb; total loaded weight 57 lb. Up to that time Goddard had achieved numerous proving-stand tests of liquid rockets, and 10 attempts at flight tests, of which four achieved flight. 1929 December 3 - 1930 June 30 - . LV Family: Goddard. Launch Vehicle: Goddard 4. Goddard rockets tests at Camp Devens - . Nation: USA. Related Persons: Goddard. Goddard conducts tests at the artillery range at Camp Devens, 25 miles from Worcester, for the improvement of liquid-fuel rocket-motor efficiency, particularly the 'curtain cooling.' Sixteen proving-stand tests were made; there were no flight tests. A few special tests were made with rocket-operated propellers. 1930 July - . LV Family: Goddard. Launch Vehicle: Goddard 4. Goddard moves rocket work to Roswell, New Mexico - . Nation: USA. Related Persons: Goddard. Goddard's liquid rocket development project was moved to New Mexico under the auspices of Daniel Guggenheim of New York City. Dr. Goddard could now devote full time to the rocket work. .
1930 October 23 - . LV Family: Goddard. Launch Vehicle: Goddard 4. Goddard begins rocket tests at Roswell - . Nation: USA. Related Persons: Goddard. Goddard first begins a series of thorough static tests in which the operating conditions were varied. The combustion chamber decided upon for use in flight tests was 5.75 inches in diameter and weighed 5 lb. In these static tests the maximum lift was 289 lb; duration 20+ sec; lifting force steady; jet velocities over 5000 ft/sec. 1930 December 30 - . Launch Site: Auburn. LV Family: Goddard. Launch Vehicle: Goddard 4. Goddard's fifth flight of a liquid fuel rocket - . Nation: USA. Related Persons: Goddard. Apogee: 0.61 km (0.38 mi). The rocket reached an altitude of 2000 ft and a maximum speed of 500 mph. The vehicle was 11 ft long; empty weight 33.5 lb; a gas pressure tank was used to force liquid oxygen and gasoline into combustion chamber..
1931 September 29 - . Launch Site: Roswell. LV Family: Goddard. Launch Vehicle: Goddard 4. Goddard rocket flight test - . Nation: USA. Related Persons: Goddard. Apogee: 0.0550 km (0.0342 mi). Flight of Goddard liquid fuel rocket with jacket, streamline casing, remote control. Length, 9 ft 11 in. ; diameter 12 in. ; weight empty 37 lb; weight loaded 87.2 lb; in air 9.6 sec; height 180 ft; trajectory 'like a fish swimming upward.'. 1931 October 13 - . Launch Site: Roswell. LV Family: Goddard. Launch Vehicle: Goddard 4. Goddard rocket flight test - . Nation: USA. Related Persons: Goddard. Apogee: 0.52 km (0.32 mi). Flight of Goddard liquid fuel rocket with simplified combustion chamber, parachute releasing. Length 7 ft 9 in. ; diameter 12 in. ; height 1700+ ft; loud whistling on descent..
1931 October 27 - . Launch Site: Roswell. LV Family: Goddard. Launch Vehicle: Goddard 4. Goddard rocket flight test - . Nation: USA. Related Persons: Goddard. Apogee: 0.41 km (0.25 mi). Range: 0.28 km (0.18 mi). Flight of Goddard liquid fuel rocket with new gasoline shutoff valve. Dimensions similar to October 13; altitude 1330 ft; landed 930 ft from tower; in air 8.6 sec..
1931 November 23 - . LV Family: Goddard. Launch Vehicle: Goddard 4. Goddard rocket static test - . Nation: USA. Related Persons: Goddard. Static test of Goddard liquid fuel rocket with modified oxygen injection; lift 270 lb for 11 sec; jet velocity 5088 ft/sec. .
1932 April 19 - . LV Family: Goddard. Launch Vehicle: Goddard 4. Goddard tests rocket with gyro stabilization. - . Nation: USA. Related Persons: Goddard. Apogee: 0.0410 km (0.0255 mi). Flight of Goddard liquid fuel rocket with pressure generated by liquid nitrogen, and eight gyro-controlled vanes (four into blast and four into slipstream) for stabilisation. Length 10 ft 9.5 in. ; weight empty 19.5 lb; height 135 ft; in air 5 sec..
Goddard work ended at Roswell. - . Nation: USA. Related Persons: Goddard. Because of the depression, Guggenheim financial support of Goddard's rocket experiments in Roswell ends. From 1930 to 1932 Goddard's team accomplished 21 providing stand tests, and 8 attempted flight tests, of which 5 achieved flight..
Goddard continues rocket research in Worcester - . Nation: USA. Related Persons: Goddard. A grant from the Smithsonian Institution enabled Dr. Goddard, who resumed full-time teaching at Clark University, Massachusetts, to carry out tests that did not require flights. .
1933 June 1 - . Goddard develops ramjet engine fuel pump. - . Nation: USA. Related Persons: Goddard. Robert H. Goddard developed component of modern ramjet engine with construction of a rocket fuel pump at Clark University..
New Guggenheim grant for Goddard - . Nation: USA. Related Persons: Goddard. A grant from the Daniel and Florence Guggenheim Foundation allows Goddard to conduct a more extended laboratory program of rocket engine tests through 1934. Studies were made in these two years of insulators, welding methods for light metals, gyroscopic balancers, reciprocating and centrifugal pumps, jet pumps, and rocket chambers utilising atmospheric air, similar to the later V-l 'buzz bomb'. 1934 September 14 - . LV Family: Goddard. Launch Vehicle: Goddard A.
Goddard obtained funding allowing liquid rocket flight tests to be resumed in Roswell, New Mexico. - . Nation: USA. Related Persons: Goddard. This funding would continue through 1941. The first test series was designated the A Series (A1-A14). The A series rockets used simple pressure feed, gyroscopic control by means of vanes, and parachute. The rockets in this series averaged in length from 13 ft 6 in. to 15 ft 3 1/4 in. ; their weight empty varied from 58 lb to 85 lb. 1935 February 16 - . Launch Site: Roswell. LV Family: Goddard. Launch Vehicle: Goddard A. Flight of Goddard A series rocket - . Nation: USA. Related Persons: Goddard. Apogee: 0.20 km (0.12 mi). Rocket had no automatic guiding device; short and rapid flight, during which the parachute was released and checked the fall..
1935 March 8 - . Launch Site: Roswell. LV Family: Goddard. Launch Vehicle: Goddard A. Flight of Goddard A series rocket - . Nation: USA. Related Persons: Goddard. Apogee: 0.30 km (0.19 mi). Range: 3.35 km (2.08 mi). Rocket was equipped with equaliser to prevent liquid-oxygen tank pressure from exceeding gasoline tank pressure, pendulum stabiliser, and 10-ft parachute; flame small and white; duration 12 sec; altitude about 1000 ft; then tilted to a horizontal powered flight at speed of over 700 mph; landed 11,000 ft from tower. Pendulum stabiliser as was expected gave an indication of operating the vanes for the first few hundred feet, but not thereafter. 1935 March 28 - . Launch Site: Roswell. LV Family: Goddard. Launch Vehicle: Goddard A. Flight of Goddard A series rocket reaches 4,800 feet. - . Nation: USA. Related Persons: Goddard. Apogee: 1.46 km (0.91 mi). Range: 4.00 km (2.40 mi). Rocket had improved gyro stabilisation; length 14 ft 9 3/4 in. ; empty weight 78 1/2 lb; altitude 4800 ft; average speed 550 mph; corrected its flight perfectly several times, for several hundred feet; horizontal distance, 13,000 ft; total time of flight, 20 sec. 1935 May 31 - . Launch Site: Roswell. LV Family: Goddard. Launch Vehicle: Goddard A. Flight of Goddard A series rocket reaches 7,500 feet. - . Nation: USA. Related Persons: Goddard. Apogee: 2.30 km (1.43 mi). Range: 1.70 km (1.06 mi). Rocket had new lift indicator; length 15 ft 1 1/2 in. ; weight 84 lb; altitude 7500 ft; excellent stabilisation; landed 5500 ft from tower, digging hole 10 in. deep; loud whistle on descent. .
1935 June 25 - . Launch Site: Roswell. LV Family: Goddard. Launch Vehicle: Goddard A. Flight of Goddard A series rocket - . Nation: USA. Related Persons: Goddard. Apogee: 0.0370 km (0.0230 mi). Rocket had new timing device for parachute, and cushioned gyro. Day was windy; duration 10 sec; height 120 ft; tipped into wind as it left the tower..
1935 July 12 - . Launch Site: Roswell. LV Family: Goddard. Launch Vehicle: Goddard A. Flight of Goddard A series rocket - . Nation: USA. Related Persons: Goddard. Apogee: 2.00 km (1.20 mi). Rocket had strainers and thicker air vanes; duration of propulsion, 14 sec; altitude 6600 ft with excellent correction up to 3000 ft; parachute torn off. .
1935 October 29 - . Launch Site: Roswell. LV Family: Goddard. Launch Vehicle: Goddard A. Flight of Goddard A series rocket - . Nation: USA. Related Persons: Goddard. Apogee: 1.22 km (0.76 mi). 1935 November 22 - . LV Family: Goddard. Launch Vehicle: Goddard K.
Goddard begins tests of his K series rockets (K1-K10). - . Nation: USA. Related Persons: Goddard. Apogee: 1.20 km (0.75 mi). This consisted of ten proving-stand tests for the development of a more powerful motor, 10 in. in diameter. Weight of rocket, about 225 lb; weight of fuels, 50-70 lb for the series..
1935 December 17 - . LV Family: Goddard. Launch Vehicle: Goddard K.
One of the best proving-stand tests of Goddard's K series of rockets. - . Nation: USA. Related Persons: Goddard. Lift 496 lb for 14 sec; weight liquid oxygen 31 lb; weight gasoline 24 lb; jet velocity, greater than 4470 ft/sec..
1936 February 12 - . LV Family: Goddard. Launch Vehicle: Goddard K.
Last and best of the proving-stand tests of Goddard's K series of rockets. - . Nation: USA. Related Persons: Goddard. Lift 623.5 lb for 4 sec; weight oxygen 25.5 lb; weight gasoline 13.5 lb; jet velocity greater than 4340 ft/sec. Average interval between K-series tests was 8 days..
1936 March 16 - . Liquid Propellant Rocket Development published. - . Nation: USA. Related Persons: Goddard. Robert H. Goddard's classic report on "Liquid Propellant Rocket Development," reviewing his liquid -fuel rocket research and flight testing since 1919, was published by the Smithsonian Institution..
1936 May 11 - . LV Family: Goddard. Launch Vehicle: Goddard L-A. Goddard begins tests of his L Series of liquid fuel rockets. - . Nation: USA. Related Persons: Goddard. These would run through August 9, 1938 and included 30 flight tests of 10-in.-diameter motors, in nitrogen-pressured rockets. The series was divided into three sections: A, B, and C. Section A covered development of a nitrogen-pressured flight rocket using 10 in, motors based on the K series and ran from May 11 to November 7, 1936 (L1-L7). Length of the L Series Section A rockets varied from 10 ft 11 in, to 13 ft 6 1/2 in. ; diameter 18 in. ; empty weight 120 to 202 lb; loaded weight 295 to 360 lb; weight oxygen about 78 lb; weight gasoline 84 lb; weight nitrogen, 4 lb. 1936 July 31 - . Launch Site: Roswell. LV Family: Goddard. Launch Vehicle: Goddard L-A. Flight of Goddard series L section A rocket - . Nation: USA. Related Persons: Goddard. Apogee: 0.0600 km (0.0373 mi). Range: 0.0900 km (0.0559 mi). Rocket achieved altitude 200 ft above 80-ft tower; duration 5 sec; landed 300 ft from tower..
1936 October 3 - . Launch Site: Roswell. LV Family: Goddard. Launch Vehicle: Goddard L-A. Flight of Goddard series L section A rocket - . Nation: USA. Related Persons: Goddard. Apogee: 0.0600 km (0.0373 mi). Rocket achieved 200 ft vertically in 5 sec, then combustion chamber burned through; weight oxygen 40 lb; weight gasoline 46 lb; weight nitrogen 4 lb; fell 20 ft from tower..
1936 October 13 - . Goddard designs dismissed. - . Nation: USA. Related Persons: Goddard. Lt. John Sessums (AAC) visited Robert H. Goddard to officially assess military value of Goddard's work. He reported that there was little military value, but that rockets would appear useful to drive turbines..
1936 November 7 - . Launch Site: Roswell. LV Family: Goddard. Launch Vehicle: Goddard L-A. Final flight of Goddard series L section A rocket - . Nation: USA. Related Persons: Goddard. Apogee: 0.0600 km (0.0373 mi). 1936 November 24 - . LV Family: Goddard. Launch Vehicle: Goddard L-B. Goddard series L section B liquid rocket tests. - . Nation: USA. Related Persons: Goddard. These were check tests of 5 3/4-in.-diameter chambers with fuels of various volatilities; development of tilting cap parachute release; tests of various forms of exposed movable air vanes; test of retractable air vanes and parachute with heavy shroud lines. The series ran from November 24, 1930-May 19, 1937 (L8-L15). 1936 December 18 - . Launch Site: Roswell. LV Family: Goddard. Launch Vehicle: Goddard L-B. Flight of Goddard series L section B rocket - . Nation: USA. Related Persons: Goddard. Apogee: 0.0010 km (0.0006 mi). Rocket was equipped with a pressure storage tank; rocket turned sharply to the right soon after it emerged from the tower, and proceeded at 150 angle above the horizontal until it landed 2000 ft from tower; noise heard at ranch house, 8 miles away..
1937 February 1 - . Launch Site: Roswell. LV Family: Goddard. Launch Vehicle: Goddard L-B. Flight of Goddard series L section B rocket - . Nation: USA. Related Persons: Goddard. Apogee: 0.57 km (0.35 mi). Rocket was equipped with gyro, air and blast vanes; length 16 ft 7 5/8 in. ; diameter 9 in. ; altitude 1870 ft; duration 20.5 sec; corrected well; ground behind flame deflector turned green and glazed by heat..
1937 February 27 - . Launch Site: Roswell. LV Family: Goddard. Launch Vehicle: Goddard L-B. Flight of Goddard series L section B rocket - . Nation: USA. Related Persons: Goddard. Apogee: 0.46 km (0.29 mi). Rocket was equipped with new parachute release operated by gyro; altitude 1500 ft; duration 20 sec; speed very high; landed 3000 ft from tower, softened ground for considerable distance..
1937 March 26 - . Launch Site: Roswell. LV Family: Goddard. Launch Vehicle: Goddard L-B. Flight of Goddard series L section B rocket - . Nation: USA. Related Persons: Goddard. Apogee: 2.60 km (1.62 mi). Rocket was equipped with larger movable air vanes; altitude 8000-9000 ft; duration 22.3 sec; corrected while propulsion lasted, then tilted; altitude uncertain because of haze remaining from dust storms..
1937 April 22 - . Launch Site: Roswell. LV Family: Goddard. Launch Vehicle: Goddard L-B. Flight of Goddard series L section B rocket - . Nation: USA. Related Persons: Goddard. Apogee: 2.00 km (1.20 mi). Rocket was equipped with larger movable air vanes and reinforced parachute; length 17 ft 9 in. ; diameter 9 in. ; duration 21.5 sec; could not be followed to top of flight, as it was nearly overhead; landed 1 mile from tower..
1937 May 19 - . Launch Site: Roswell. LV Family: Goddard. Launch Vehicle: Goddard L-B. Final flight of Goddard series L section B rocket - . Nation: USA. Related Persons: Goddard. Apogee: 0.99 km (0.62 mi). 1937 July 28 - . LV Family: Goddard. Launch Vehicle: Goddard L-C.
Start of Goddard series L section C liquid rocket tests - . Nation: USA. Related Persons: Goddard. These would run through August 9, 1938 (L16-L30). Section C rockets included light tank construction, movable-tailpiece (i.e. gimbal) steering, catapult launching, and further development of liquid nitrogen tank pressure method. Lengths varied from 17 ft 4.25 in. to 18 ft 5.75 in. ; diameter 9 in., weight empty varied from 80 to 1091b; loaded weight about 170 lb or more; lift of static tests varied from 228 lb to 477 lb; jet velocities from 3960 to 5340 ft/sec. These tests indicated extremely high temperatures for the jet: pebbles of the cement gas deflector were fused and thrown out, starting fires more than 50 ft from the tower. 1937 July 28 - . Launch Site: Roswell. LV Family: Goddard. Launch Vehicle: Goddard L-C. Flight of Goddard series L section C rocket - . Nation: USA. Related Persons: Goddard. Apogee: 0.63 km (0.39 mi). Rocket was equipped with movable-tailpiece or gimbal steering, with wire-wound tanks and barograph; length 18 ft 5.5 in. ; diameter 9 in. ; weight empty 95 lb 5 oz; loaded 162 lb 5 oz; 39 lb liquid oxygen, 28 lb gasoline; altitude 2055 ft; duration 28 sec; parachute opened near ground, checked speed; coasted one-eighth of ascent; landed 1000 ft from tower. 1937 August 26 - . Launch Site: Roswell. LV Family: Goddard. Launch Vehicle: Goddard L-C. Flight of Goddard series L section C rocket - . Nation: USA. Related Persons: Goddard. Apogee: 0.60 km (0.37 mi). Rocket was equipped with movable-tailpiece steering, catapult launching; length 18 ft 5.5 in. ; diameter 9 in. ; weight loaded 162 lb; altitude 2000+ ft; corrected well and strongly seven times in flight. .
1937 November 24 - . Launch Site: Roswell. LV Family: Goddard. Launch Vehicle: Goddard L-C. Flight of Goddard series L section C rocket. - . Nation: USA. Related Persons: Goddard. Apogee: 0.0300 km (0.0186 mi). Short flight, leaned after leaving tower, fell 100 ft from tower; lift low..
1938 March 6 - . Launch Site: Roswell. LV Family: Goddard. Launch Vehicle: Goddard L-C. Flight of Goddard series L section C rocket. - . Nation: USA. Related Persons: Goddard. Apogee: 0.16 km (0.10 mi). Short flight, 500 ft plus coasting period, very fast in leaving tower; little smoke..
1938 March 17 - . Launch Site: Roswell. LV Family: Goddard. Launch Vehicle: Goddard L-C. Flight of Goddard series L section C rocket - . Nation: USA. Related Persons: Goddard. Apogee: 0.66 km (0.41 mi). Rocket reached altitude 2170 ft; duration 15 sec; vertical to 800 ft, then leaned to right; landed 3000 ft from tower; little smoke. .
1938 April 20 - . Launch Site: Roswell. LV Family: Goddard. Launch Vehicle: Goddard L-C. Flight of Goddard series L section C rocket - . Nation: USA. Related Persons: Goddard. Apogee: 1.26 km (0.78 mi). Rocket reached altitude 4215 ft; duration of propulsion 25.3 sec; landed 6960 ft from tower; carried official NAA barograph. .
1938 May 26 - . Launch Site: Roswell. LV Family: Goddard. Launch Vehicle: Goddard L-C. Flight of Goddard series L section C rocket - . Nation: USA. Related Persons: Goddard. Apogee: 0.0400 km (0.0249 mi). Rocket reached altitude 140 ft; veered to right, landed 500-600 ft from tower..
1938 August 9 - . Launch Site: Roswell. LV Family: Goddard. Launch Vehicle: Goddard L-C. Flight of Goddard series L section C rocket - . Nation: USA. Related Persons: Goddard. Apogee: 1.50 km (0.90 mi). 1938 October 17 - . Goddard experiments toward development of propellant pumps. - . Nation: USA. Related Persons: Goddard. After the final successful L series flight of August 9, with pressure feed, Goddard turned again to the problem of fuel pumps, which he believed were imperative if very high altitudes were to be attained. This ultimately resulted in the P Series of Tests, which ran from October 17, 1938-October 10, 1941. The work began in the fall of 1938, when he made a thorough study, through more than twenty proving-stand tests, of five models of small, high-speed centrifugal pumps, which had several radically new features. 1939 January 6 - . Goddard Series P Section A rocket tests - . Nation: USA. Related Persons: Goddard. Goddard began tests of two propellant pumps, called A and D. These were selected for use in four proving-stand tests (P1 to P4), from January 6 to February 28, 1939. From these tests it was concluded that a small chamber, or gas generator, producing warm oxygen gas, should be developed for operating the turbines. 1939 February 7 - . Best test of new Goddard liquid propellant pumps. - . Nation: USA. Related Persons: Goddard. Engine used 29 lb liquid oxygen; 45 lb gasoline; produced 671 lb of lift for 12 sec, with jet velocity of 4820 ft/sec; oxygen 2.15 lb/sec; gasoline, 2.28 lb/sec; mixture ratio 0.94. Over 24 pump tests were completed by the time of the last run on February 28. 1939 March 24 - . Goddard Series P Section B rocket tests - . Nation: USA. Related Persons: Goddard. Series P section B was a series of tests by Goddard in development of a gas generator to run turbines. Through April 28 a series of eleven static tests (Pa-k) of a new gas generator was made near the shop. The best form developed ran steadily for 10 sec at 180 psi for 250-psi tank pressures, with the rate of flow of oxygen at 0.49 lb/sec. 1939 May 15 - . 1939 November 18 - . LV Family: Goddard. Launch Vehicle: Goddard P-C.
Goddard Series P Section C rocket tests - . Nation: USA. Related Persons: Goddard. Section C tests would run through October 10, 1941. The series of twenty-four static and flight tests (P13-P36) was made with rockets of large fuel capacity, with the rocket motor, pumps, and turbines previously developed. These rockets averaged nearly 22 ft in length, and were 18 in, in diameter. They weighed empty from 190 to 240 lb. The liquid-oxygen load averaged about 140 lb, the gasoline 112 lb, making 'quarter-ton' loaded rockets. 1939 December 2 - . LV Family: Goddard. Launch Vehicle: Goddard P-C.
Goddard Series P Section C rocket static test - . Nation: USA. Related Persons: Goddard. Static test at flight tower; steady 40-sec run; lift 760 lb. .
1940 May 15 - . LV Family: Goddard. Launch Vehicle: Goddard P-C.
Goddard Series P Section C rocket static test - . Nation: USA. Related Persons: Goddard. Static test, flame hot, apparently large lift; ground behind dame deflector looked melted..
1940 May 28 - . Goddard designs rejected by US military. - . Nation: USA. Related Persons: Goddard. 1940 June 11 - . LV Family: Goddard. Launch Vehicle: Goddard P-C.
Goddard Series P Section C rocket static test - . Nation: USA. Related Persons: Goddard. Static test, steadier run 43.5 sec, longest to date; red-hot stones seen to fly up out of cement gas deflector..
1940 July 1 - . Rocket ordnance research begun. - . Nation: USA. Related Persons: Goddard. National Defense Research Committee established Jet Propulsion Research Committee under Section H of Division A, at Naval Powder Factory, Indian Head, Md., to conduct fundamental research on rocket ordnance. C. N. Hickman, who had worked with Goddard during World War I, was named as head. 1940 August 9 - . Launch Site: Roswell. LV Family: Goddard. Launch Vehicle: Goddard P-C.
Goddard Series P Section C rocket flight test - . Nation: USA. Related Persons: Goddard. Apogee: 0.0900 km (0.0559 mi). First flight with pumps, altitude 300 ft; velocity low, 10-15 mph. .
1941 January 6 - . LV Family: Goddard. Launch Vehicle: Goddard P-C.
Goddard Series P Section C rocket static test - . Nation: USA. Related Persons: Goddard. Static test, highest lift so far recorded, 985 lb. .
1941 May 8 - . Launch Site: Roswell. LV Family: Goddard. Launch Vehicle: Goddard P-C.
Goddard Series P Section C rocket flight test - . Nation: USA. Related Persons: Goddard. Apogee: 0.0800 km (0.0497 mi). Second flight with pumps, altitude 250 ft; then heeled away from tower..
1941 July 17 - . LV Family: Goddard. Launch Vehicle: Goddard P-C.
Goddard Series P Section C rocket static test - . Nation: USA. Related Persons: Goddard. Static test: duration 34 sec; average thrust 825+ lb; gas ejection velocity 4060 ft/sec; average thrust per pound of fuel per second 128; mechanical horsepower 3040; liquid oxygen 131.7 lb; gasoline 91.5 lb; ratio oxygen to gasoline 1.43. .
1941 October 19 - . LV Family: Goddard. Launch Vehicle: Goddard P-C.
End of Goddard sounding rocket tests - . Nation: USA. Related Persons: Goddard. Goddard leaves Roswell. - . Nation: USA. Related Persons: Goddard. Goddard's rocket team and equipment were moved from Roswell, New Mexico, to the Naval Engineering Experiment Station at Annapolis, Maryland, where they continued work until the end of the war. During this time a liquid-propellant assisted-takeoff unit for aircraft was developed and flight-tested. Goddard's rocket team ends its work. - . Nation: USA. Related Persons: Goddard. Spacecraft Bus: XS-1. Spacecraft: X-2. Goddard's rocket team ends its work at the Naval Engineering Experiment Station at Annapolis, Maryland. During the previous three years the team had developed a variable-thrust rocket motors. This required hundreds of proving-stand tests, but eventually producing a successful motor, later used on the Bell X-2 rocket plane. 1945 August 10 - . Dr. Robert Goddard died in Baltimore. - . Nation: USA. Related Persons: Goddard. 1948 December 14 - . Robert H. Goddard Chairs established - . Nation: USA. Related Persons: Goddard. Jet Propulsion Centers established at Princeton University and the California Institute of Technology by the Daniel and Florence Guggenheim Foundation to provide research facilities and graduate training for qualified young scientists and engineers in rocketry and astronautics. Robert H. Goddard Chairs were established at each center. 1959 May 1 - . Goddard Space Flight Center established. - . Nation: USA. Related Persons: Goddard, Goett. NASA's Administrator announced the naming of Goddard Space Flight Center under construction near Greenbelt, Md., in commemoration of Robert H. Goddard, American pioneer in rocket research. Dr. Harry J. Goett was appointed Director in September. STG was transferred to the authority of the newly formed Goddard Space Flight Center but remained based at Langley Field, Va.